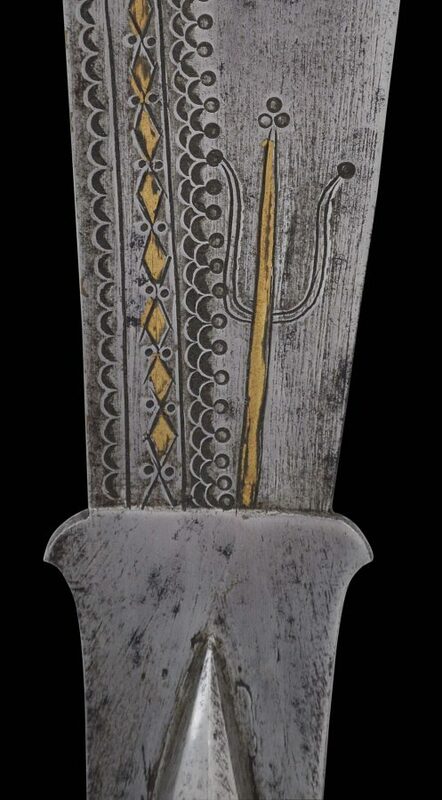 It is a fine example of a ram dao sword. 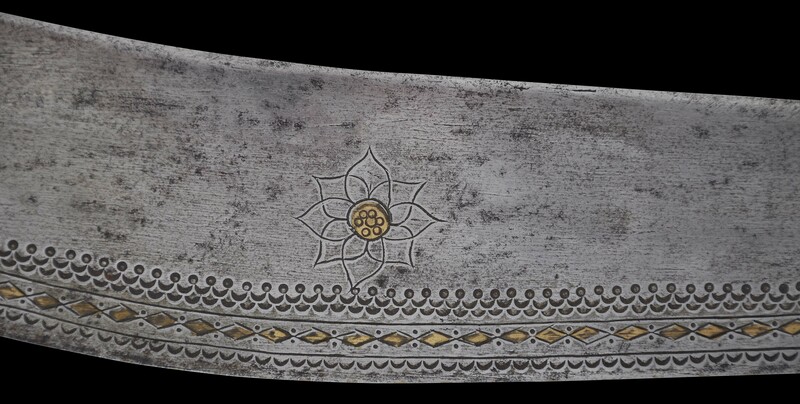 The blade, in steel, is dramatically engraved and inlaid with brass on both sides with an ‘eye’ and eyebrow. One side is also engraved with a fine lotus flower and motif, and a trident or trisula, which is overlaid with brass. The trisula is a symbol of Kali. The handle is of wood with brass mounts and is finely carved with rings to allow for a better grip. 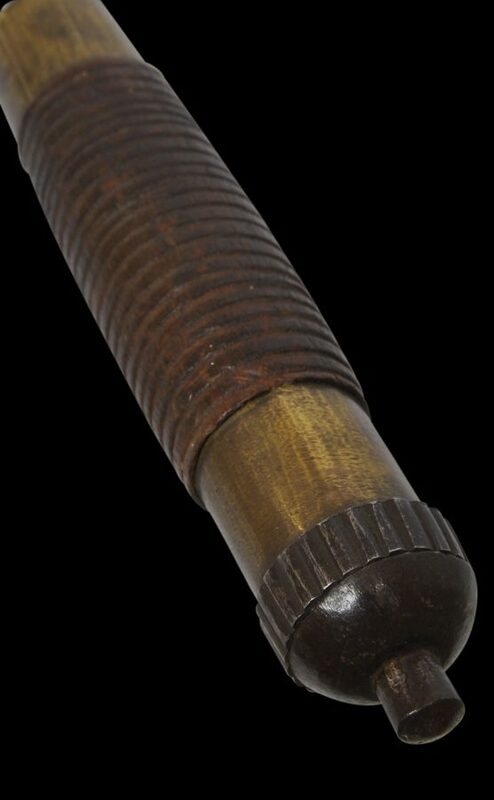 The handle is capped with an attractive steel end finial. 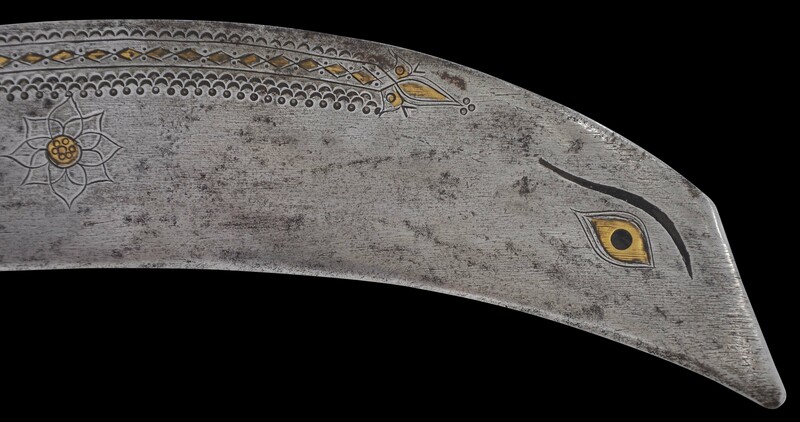 Such blades were made and used by the Newar people, the indigenous people of the Kathmandu Valley, although today, they account for less than 6% of Nepal’s total population. Around 80% are Hindu, and most of the remainder are Buddhists. Overall, this is a very fine example. It has great presence and is highly decorative. It is has obvious age, is complete, and is free of repairs. Excerpt from: Inside Knowledge: Streetwise in Asia by Michael Backman (Palgrave-Macmillan, 2005), p. 98:”Hindu cosmology has four ages. In which do we live? We live in the worst. The gods Vishnu and Shiva are asleep and do not hear the prayers of their devotees. It is an age when the natural order of things breaks down, an age of corruption and violence. Two world wars, nuclear weapons, international terrorism, even global warming are all products of this age. It is the Age of Kali, the consort of Shiva. And so I visit the temple of Dakshinkali, 20 kilometres outside Kathmandu. It is the most important temple in this overwhelmingly Hindu country. It is devoted to Kali. The temple stands at the edge of a still, dark valley, surrounded by forested hills and at the confluence of two rivers. I stand in the temple’s forecourt, my bare feet mired in mud and blood, for Kali requires sacrifices, and specifically, the blood of uncastrated male animals. For more than an hour I watch various animals – three goats, chickens and ducks – have their throats cut open. The butchers hold each terrified, dying animal aloft, and sway it to and fro, with one hand on the body of the animal and the other beneath its chin so that the neck wound gapes open. Sliced jugular veins spray steaming blood onto a row of stone statues of Kali and other gods. Some release their contents with a whimper. Others do so geyser-like, the dark red ejaculate splashing out in a series of angry gushes, draining the kicking animal of life and spirit. Elgood, R., Hindu Arms and Ritual: Arms and Armour from India 1400-1865, Eburon, 2004.